Singapore has major aviation facilities, and I planned my 100 hour inspection for the stop here. 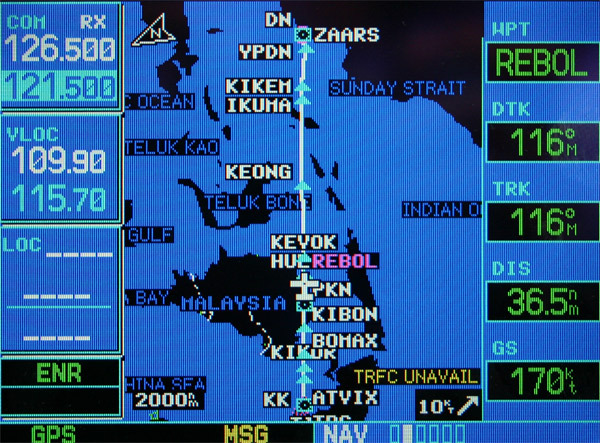 Along the way, a few items failed (back-up electric attitude indicator, for one), and replacements were shipped to Singapore for installation. I arrived late Friday afternoon, but Hawker Pacific arranged for a team of four to come out on Saturday to help out. We changed the oil and filter, swapped out the plugs for new ones and cleaned a huge amount of garbage out of the old. A crusty cake was beneath the electrodes, as much as a teaspoon came out of some. The engine was running well except for a brief foul on #6 that cleared on its own. The HF antenna was repaired, the AI was installed. The ground run and short test flight were fine, and we fueled it for Monday morning. 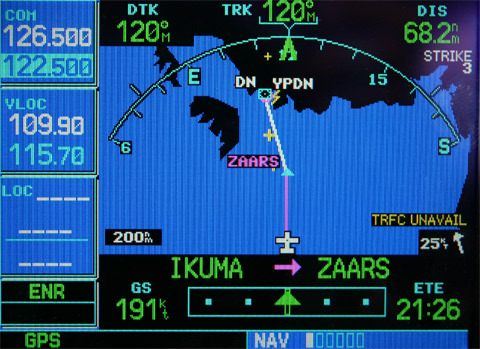 I considered the fuel, the airport is sea level but short, the take off procedures are highly restrictive, requiring a tight 180 turn after takeoff, and the runway is 21 at night due to unlit obstacles to the north. 21 is also uphill, 1.2% first half, 0.7% second half. My wake up call comes at 02:55 local, and I make it to the airport, where I am greeted with a met report, copy of flight plan, drinks, and ice. They take me out to the plane and help load up, and I am ready for takeoff at 04:52 local. I have a tailwind, uphill, warm (25C) heavy, dark with storms nearby, and a mandatory 180 within 2 miles. I really worry this one over. I expect storms in Darwin and all along the way, and want time to deviate. I have 17 hours fuel for a 12:30 trip, the closest I have planned yet. Climbing out after departure from Singapore, with strikes. 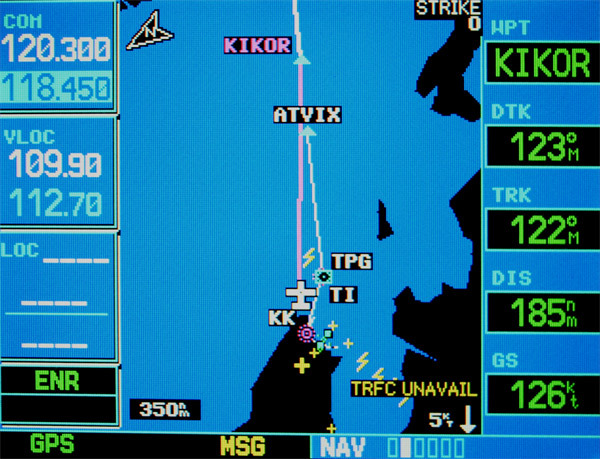 Notice waypoint KIKOR and scale. The trip barely fits on the largest scale. Notice KIKOR. The airplane icon is 160 miles long. REBOL is under the nose. The tower clears me, and I get airborne at 2500 feet, reach 120 knots indicated, and turn within the limits. It goes better than I had expected, but very soon I am dark IMC with the strong sound of rain. Most of the stormscope activity is behind me, but the occasional flash lights up the clouds. It is mostly smooth, and before long I’m cruising at FL110 (FL is altitude in feet/100), in and out of clouds that I can’t see. I get an HF frequency relatively quickly, and hear lots of noise, and have trouble getting through. 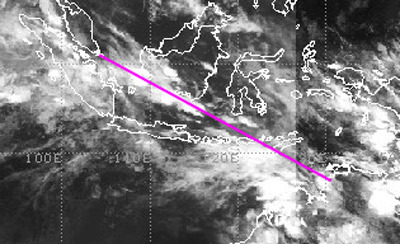 It seems everyone is having difficulty, but I pass from Singapore control to Jakarta, then Bali. It only takes about 20 tries, and I really can’t hear much of what is said, the radio is 1 to 3/5, the English is heavily accented. The constant hiss and scratch become tiresome, with the volume turned up high to hear possible calls. Finally, I give Brisbane control a call, and the clear clean English and strong transmitter are a welcome change. The winds become favorable shortly into the flight, with tailwind of 15 knots halfway there. 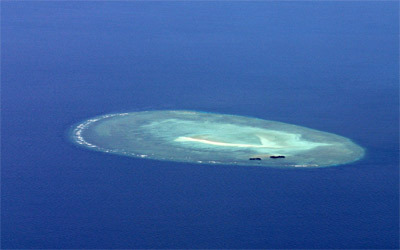 The whole trip is under a high overcast, which makes the islands that pass beneath less photogenic. 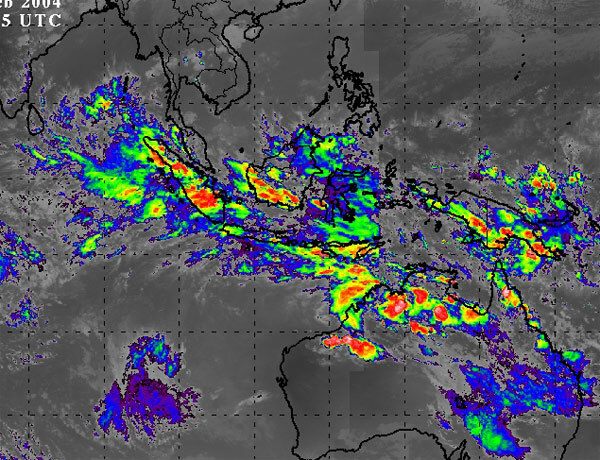 As expected, later in the day, convection builds up with one big line across Timor, and more building closer to Darwin. I go through a few heavy rainstorms, but am able to stay away from the areas where strikes show on the stormscope. I am cruising at 110, and Brisbane Control informs me the altimeter is now 1001 mb, or 29.57” Hg. With transition altitude at 11,000 feet in Australia, 110 isn’t available with such a low altimeter setting (the barometer being that low explains the bad weather, also), and I am asked to go up or down. I choose 130, and climb through another storm, but pick up 25 knot tail wind, and have a ground speed of 190. 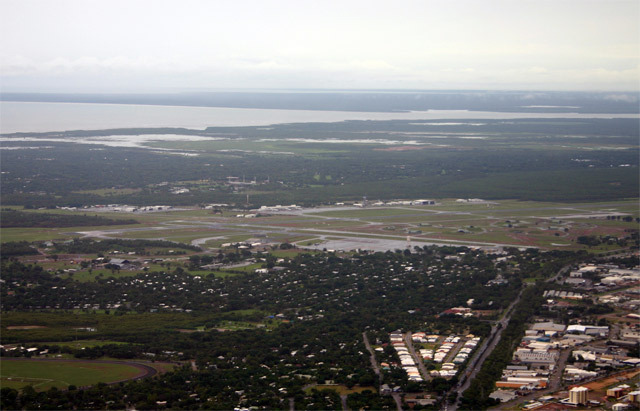 I am stepped down by Darwin control, there is a large storm south of the airport, but I make a VFR approach for 29, and land and taxi to customs. Just over 11 hours, and I still have 76 gallons left. Tailwind, bad weather, an hour to go. The northern coast of Australia, the sixth continent I have visited in a month. 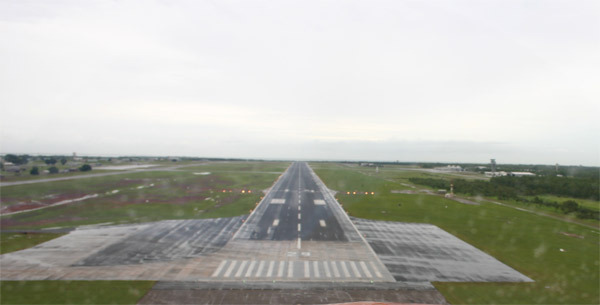 Short final in the rain at YPDN, runway 29. After taking me to the hotel, Klaus, a Mooney driver, gives me his avionics shop’s number. The next morning, after a call, I am back at the airport, looking over the radios, and we find and fix a loose post where the noise suppression capacitor attaches to the alternator. The test run proves the static on com one and HF is gone. Listening to your alternator over the HF for 11 hours is torture. It can also interfere with transmission quality. The people at NT Avionics and Phoenix Aviation are curious about the plane, ask lots of questions, and very helpful and kind. I get all my things done within an hour or so. Happy about a fix, I get a car and head out to explore.